Q. How do I change the lending period for OverDrive and Libby eBooks and Audiobooks? I thought I could borrow eBooks and Audiobooks for 21 days, but it looks like everything I borrow is due in a week. Help! 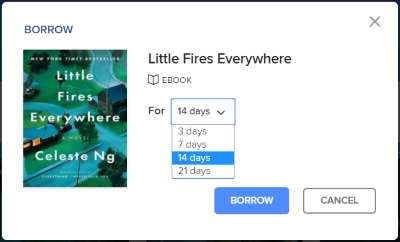 You can borrow eBooks and Audiobooks from Overdrive or Libby for 7 days, 14 days, or 21 days. It's your choice! You can also set a default lending period for all items in a given format. You can change your loan period for each title when you borrow it. After you tap Borrow, tap the underlined loan period on the confirmation page. Then, select a new loan period for that title. When you pick a new loan period, it'll be your default loan period for future checkouts in that format.